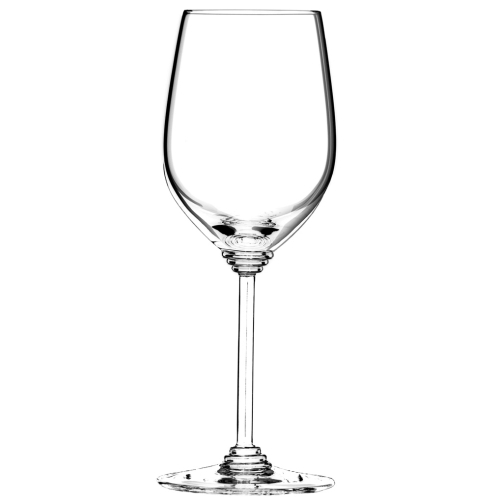 Sip your favorite wine in style with this set of two Riedel Wine Series glasses. Riedel's Wine collection was created for customers, who feel that plain stemware on a well laid table is just not decorative enough. It combines a light catching, decorative stem and the most popular bowl shapes. Each glass is expertly balanced and very sturdy, as the "Wine" collection is appropriate for everyday use and is ideal for all users who are expanding their wine palate with exploration of many wines from many regions of the world. With this fine collection of glasses, Riedel achieves what the essence of wine and other beverage drinking is all about: enjoyment.